Every 6 months on my blog I put out an interest rate prediction. In November I predicted rates to remain close to where they currently are now. How was my prediction? In November of 2013 the average rate from Freddie Mac’s weekly survey on a 30 year fixed rate was 4.16% paying .8 points. Last week Freddie Mac’s survey showed rates at 4.12% paying .6 points. Basically, that’s the same rate. So, pretty good prediction, thank you very much! 1) The Economy. The economy is not getting stronger and I don’t believe it will get better the rest of the year. It’s June and the pundits are still blaming everything on the weather. Enough already. 2) Housing. Housing is slow. Take out all the Wall Street cash buyers and the numbers are just not good. Too many people are under water, there are not enough first time home buyers, and wages are not increasing while home prices continue to increase. Something has to give. One thing that will help is lower rates. Another would be a low down payment mortgage for first time home buyers. I’m predicting both will happen. 3) Decreasing Mortgage Production. Mortgage production is at a 17 year low and by the end of the year it might be at a 25 year low. Low mortgage production is bad all around. It’s bad for most major bank’s bottom lines. It’s bad for all the lay-offs in the mortgage industry. It’s bad because less people refinance meaning less money goes into the economy. And it’s bad because it means there are less purchases which effects numerous areas of the economy in a negative way. Put all these factors together and rates have to fall. I predict June and July economic numbers to remain weak. Blaming bad winter weather will no longer be an option. It’s been a rough week for rates. 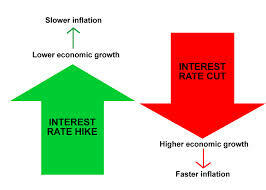 Yesterday the FED announced it will start tapering and the rates increased approximately .125%. The bigger hit came Monday when Fannie Mae announced their new pricing adjustments. These new fees go into effect for loans purchased after April 1st, 2014. That means most lenders will start changing their fees now. Take a look at the chart below. 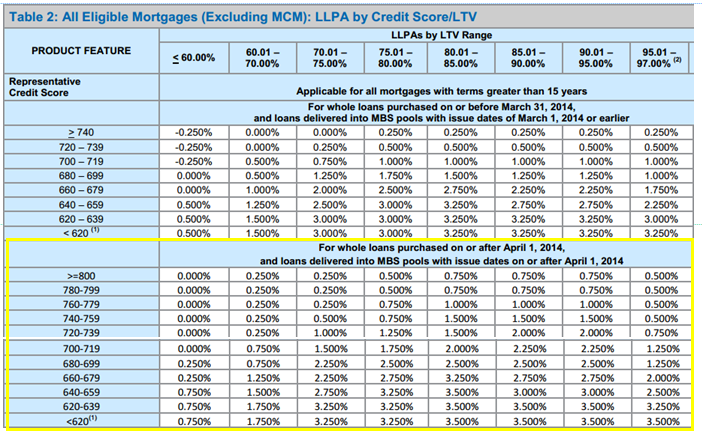 For a 5% down mortgage with a 720 credit score the hit is currently .5% (basically .125% in interest rate). The new fee is 2%! That is roughly .375% in interest rate! Wow! So, in one day, we basically saw the rates rise .5%. That’s rough. This is just a nasty hit. A 20% down 800 credit score gets hit .5%? That’s brutal. In my opinion, this is not a good time for these increases. The housing market is starting to come back somewhat and these increases will not help housing. They will only hurt. Jobs Report Week! What Impact Will it Have on Rates? This Friday the monthly unemployment numbers will be announced. The Jobs Report is always the biggest indicator for what direction the rates will take for the next 30 days. 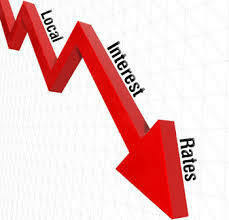 If the number is strong look for rates to rise and tapering talk to escalate. If the number is weak look for tapering talk to be pushed back and rates will fall. If the number is in line with expectations look for rates to remain stable for the next 30 days. Predicting interest rates is not an exact science. There are just too many different variables and unpredictable things that can take place to be 100% accurate. But I’ve been doing this for 26 years and I feel I have a good sense about the major driving points that move the rates. So, what does it look like for the next 6 months? In general, the better the economy, the higher the rates. The weaker the economy, the lower the rates. When the economy is weak the FED will put money into the economy to help stimulate growth. This has been going on for a while now. The FED FUNDS rate is at .25%. You can not get much lower than that. 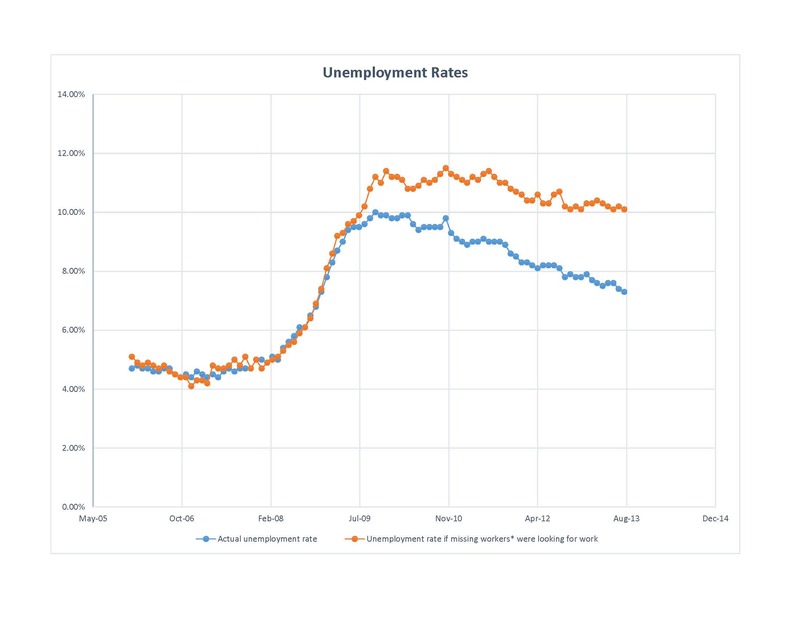 One way the FED measures the strength of the economy is the unemployment rate. 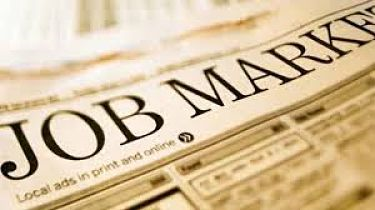 Currently the unemployment rates sits at 7.2% although most experts think it is much higher because of all the people that have stopped looking for work. But what the FED said this week alerted me to what they think is going on. The FED has been saying that they will stop stimulating the economy when the unemployment rate hits 6%. But today they hinted that they are moving the number to 5.5%. To me, that signals that they believe the economy is weak and the unemployment number is really much higher than is being reported. Therefore, I see rates over the next 6 months to remain low. There will be ups and downs, but in general, you will see 30 year fixed rates hover around where they are today.